Miniso, a Japan-based designer home décor, gifts and trinkets brand, was co-founded by Japanese designer Mr. Miyake Junya and Chinese young entrepreneur Mr. Ye Guofu in Tokyo, Japan, with the former serving as chief designer. We are promoters of global “intelligent consumer products”. The store offers a wide range of creative lifestyle products. From quirky home décor to gifts and more, there is a lot to choose from at Miniso Dubai. 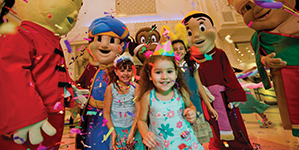 Check out whats going on at Ibn Battuta today. Everyone loves a good deal. See our latest offers. See what exciting events are coming up soon.